The Tooheys New Economy print advertising campaign, developed at Saatchi & Saatchi, Sydney, is on the shortlist for the London International Awards being announced this coming week. 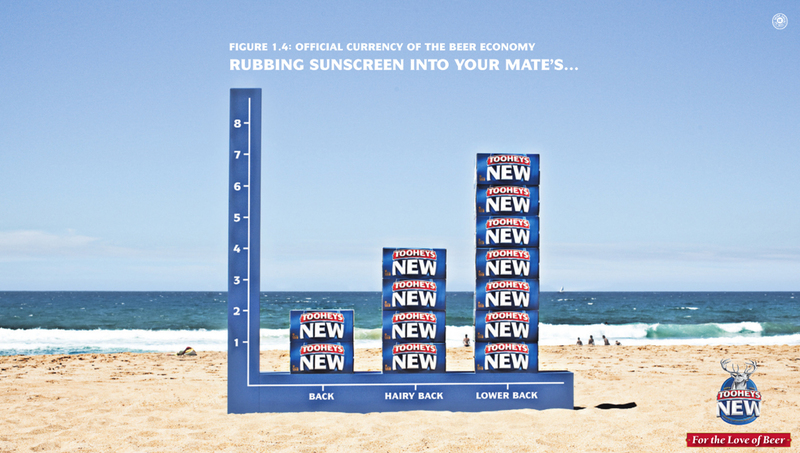 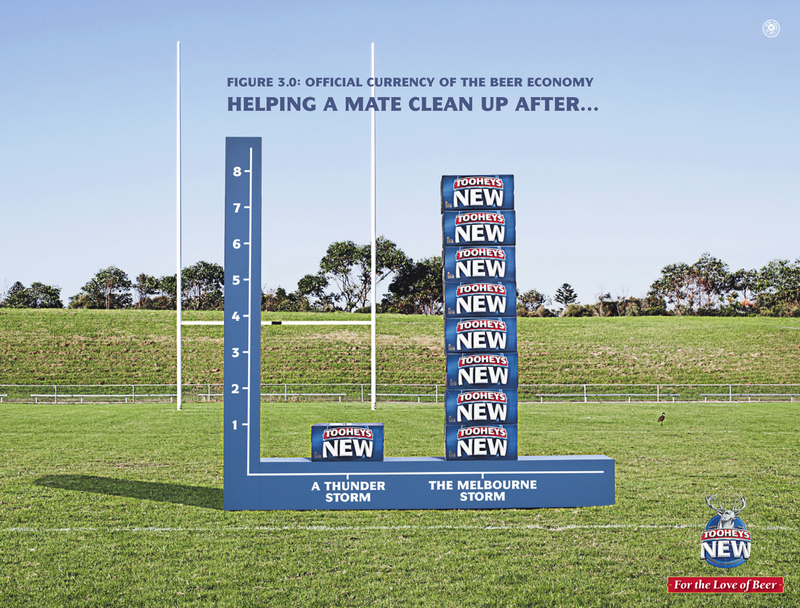 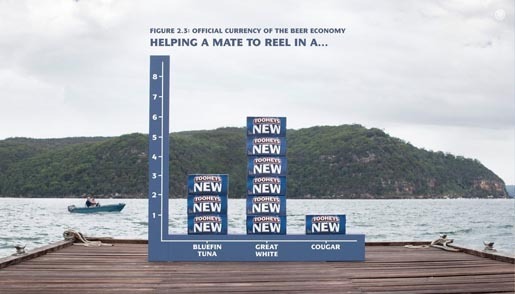 Figures from the Official Currency of the Beer Economy reveal just how much Tooheys New is worth in terms of rubbing sunscreen into your mate’s back, hairy back and lower back (Sunscreen Figure 1.4), helping a mate reel in a bluefin tuna, great white or cougar (Reeling In Figure 2.3), helping a mate clean up after a thunder storm or the Melbourne Storm (Storm Figure 3.0), and helping a mate clear his yard or name (Yard Figure 3.1). 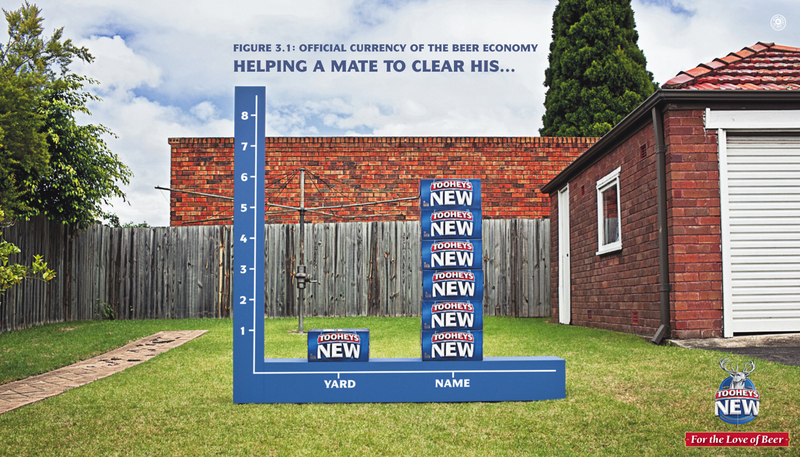 The Economy Figures campaign was developed at Saatchi & Saatchi Australia, Sydney, by executive creative director Steve Back, creative director Dave Bowman, copywriters John McKelvey (Southpaw) and James Ross-Edwards, art director Peter Galmes (Southpaw), art buyer Skye Houghton, Sydney, agency account directors Alex Carr and Chris Yong, and photographer Chris Searl, working with Lion Nathan account director Todd Atkinson. Produced by Adam at Six Wolves. Set build by Daniel Borne.